Dredd 3D is a gritty, guns blazing action filled romp, not to be missed by fans of action movies and comic book movies alike. 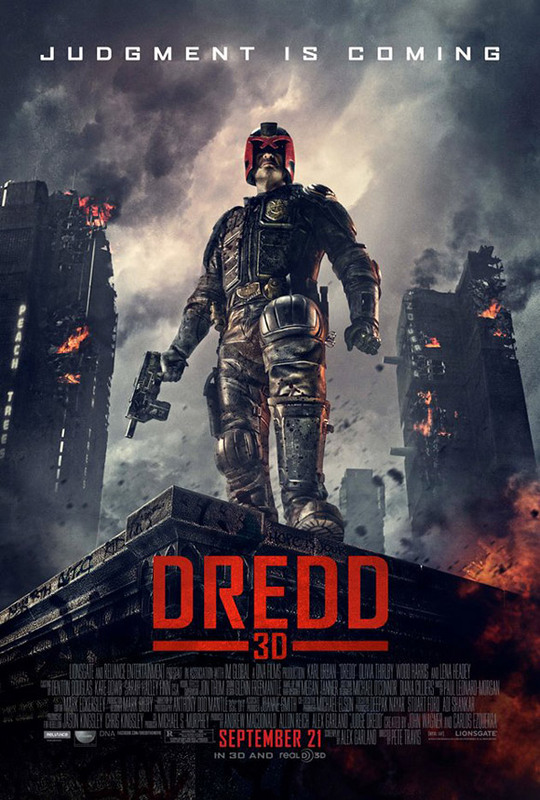 With a screenplay written by Danny Boyle stalwart Alex Garland, Dredd 3D takes us on a day in the life of Judge Dredd, played pitch perfectly by Karl Urban. Taking place in a future where Judges are deputized and given jurisdiction to mete out justice as they see fit, the story finds our iconic titular character as he is given the duty of assessing the prowess of rookie Judge Anderson (played by Olivia Thirlby). On this day, Judges Dredd and Anderson are sent to Peach Trees, a housing project in Mega City 1 rife with gang warfare, drug dealing and poverty, to investigate three murders that took place in the courtyard of the building. Upon investigating, it is determined that these murders are drug related and the Judges end up catching and arresting one of the lower level drug dealers responsible. Enter Ma-Ma, kingpin of the drug operations in Peach Trees. In order to trap the Judges, Ma-Ma (played by Lena Heady of Game of Thrones fame) successfully closes Peach Trees off from the outside world with the Judges and their hostage inside. Ma-Ma then challenges all of the residents to either capture and kill the Judges or get out of the way as carnage ensues. As this is the second attempt of putting Judge Dredd on the big screen, it should be noted that first and foremost, this is a “fanboy” labor of love. Every aspect of this movie is given meticulous attention to detail as it relates to the original source material, done in such a way that is accessible to both the weathered fans of the books as well as those who are new to the story. All in all, Dredd 3-D delivers what it promises; a white knuckled action thrill ride of a movie, while keeping itself grounded in the reality set fourth by the source material. Highly recommended for fans of the genre. Dredd 3D opens today in Philly-area theaters.